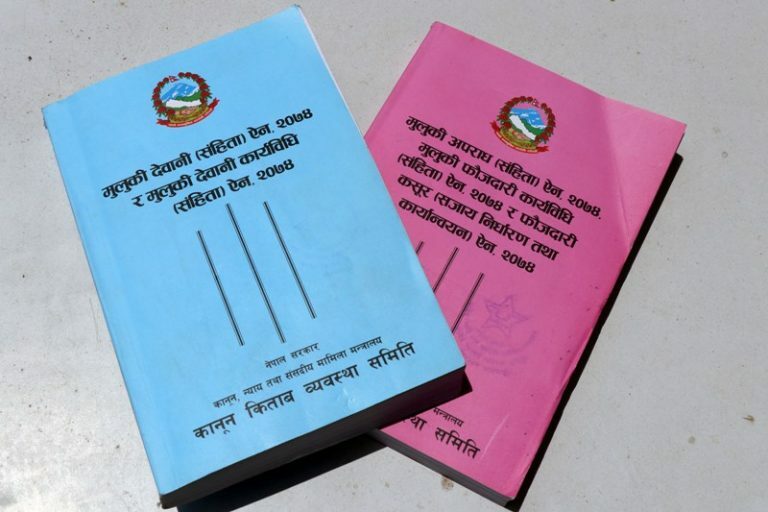 KATHMANDU, August 17: A new civil code came into force from today, August 17 by replacing the long –existing Muluki Ain (General Code of Nepal) that was first drafted during the reign of the first Rana Prime Minister, Junga Bahadur Rana, in 1910 BS. The previous code which was based on religious practices, norms and values; and the traditions and customs pervasive in the then society remained in force total 164 years, though amendments and alterations were made to it over the course of time. The first amendment was made in 2020 BS. The new one has a civil code, the criminal code and a code of civil and criminal procedures. The new code appearing as the longest act of Nepal so far consists of six parts, 52 chapters and 721 clauses. It was formulated by scrapping separate 31 laws and integrating others 36 laws. The new code covers up the 60 percent provisions in the previous code, 20 percent court precedents and 20 percent international laws. Senior advocate Dr Chandrakanta Gyawali described the new code as an integrated form of prevailing acts and laws presented in a simplest form so that citizens could easily understand and interpret them. The civil code has given every individual the status of a natural and legal person, and incorporates separate provisions about family, property, contract and private and international laws. “The old general code was majorly based on the Hindu religion while the new one has been formulated in accordance with the international laws, treaties/ agreements, and by incorporating international practices, court practices and precedents,” advocate Dr Gyawali said. It has been presented in a simple language which is easily understood and there is a need of launching awareness campaign at grassroots level by the government. Nepal Bar Association Vice-chair and senior advocate Usha Malla Pathak said the old civil code had some traditional provisions and the civil code appeared in its modern form as per the development of the Nepali society. Earlier, a task force was formed by the government under the convennorship of former chief justice Khil Raj Regmi to prepare the draft of the civil code. The parliament held extensive discussions on the draft presented by the same task force before passing it last year by a majority. It comprises many new provisions and has defined people below 18 as minors. The age-limit for being legally minors in the old civil code was below 16. The new civil code has for the time made provisions under which any wrongdoer would have to bear the loss resulting from such wrongful act. It also prohibits all sorts of acts capable of causing harm to others. It demands the establishment of good neighborly relations. It contains provisions dismissing the customs and traditions that are against the law. Similarly, any person is permitted to undergo medical test of own body organs or change them being in accordance with the laws. An individual can determine the procedure for performing one’s last rites and death rituals while still alive. The marriageable age for both female and male is 20. Any marriage conducted without one’s knowledge and the marriage with a person suffering from terminal illness or disease, who is already married, pregnant and convicted of a criminal offense through deception or cheating shall be rendered invalidated. The second marriage has been criminalized except in some cases- divorce between a husband and a wife, demise of a husband or a wife, or living separately upon receiving their property shares. Similarly, a child born after 180 days of the date of marriage and within 272 days from the date of the demise of the husband or the termination of the conjugal relations , unless otherwise provided, shall be considered to be the child of the (same) husband. The civil code mentions that in case of a child whose father and mother are not identified and while making a claim that the child is one’s son and daughter, such claim shall be made within the two years of the birth of the child or the child’s identification. Any child born through the artificial insemination using the sperm donated by a third person on the consent of husband/wife shall be considered to be fathered by the legal husband. Birth registration of the child should be done within three months of the date of birth. Despite the termination of marriage between the couple, their children have their legal right over mother and father. The mother’s responsibility toward the child still remains in such circumstances. The code makes it mandatory for the offspring to respect their parents and to take care of them. The responsibility of taking care of incapable and semi-capable person lies with their guardian. In absence of a guardian, an authorized person can take care of such persons. A person who has got a son and a daughter shall not be entitled to adopt a son and daughter, respectively. But it is permissible when the court allows for so bearing in mind the financial status of any person (would be adopter). Any insane person, or a person who is convicted of criminal offence and with low economic status is prohibited to adopt a son or a daughter. Details regarding own the financial/economic status shall be certified by the respective district court while undertaking a process to adopt a child. The provision about the adoption of a daughter or son by foreigner has been incorporated in the law. In the civil code, heirless property of any person shall pass on to his/her distant relative or a third person provided that a person has been deprived of care by the nearest kin and is taken care of by the same distant relative or the third person. Property has been categorized as moveable and immovable on the basis of its forms and family, joint, community, public, government and Guthis, and the possession of Guthis is permissible for public and private purposes. If any person has been using moveable property of another person for the continuous three years and immovable property for over 30 years as his/her own, except in case of the government, public, community or guthi’s properties or unless otherwise mentioned by the contract or other laws, that person can register such property under own name considering the condition as incompatible to tenancy right. None is allowed to release water from one’s house or roof boundary within the courtyard or house boundary, and other’s land or public road. The provision about granting free use of private land by anther person without the transfer of ownership has been guaranteed. Similarly, during fire, earthquake and other sorts of disasters, the use of others’ property for the purposes of drainage, drinking water, electricity, extension of telephone services, and cultivation is allowed by giving compensation to the owner. The new legal system demands an agreement in writing between the house owner and tenant or occupant if the house rent is above Rs 20,000 monthly. Renting of unsafe house is banned by the law and the responsibilities of the house owner and tenant shall be as defined by the laws while the tenant can give the rented property to the third person being confined to the agreement made with the house owner. The house owner has the right to rent out the house to a third party if the tenant goes missing . The law has the provision that allows hiring the child above 14 as a domestic help and it is informed to the local level within one month of the hiring. The education, healthcare facilities and proper remuneration of such child, however, must be guaranteed.